봉화 태자사 낭공대사탑비는 신라말 고려초의 고승인 낭공대사(朗空大師) 행적(行寂)〔832(흥덕왕7)～ 916(신덕왕5)〕의 탑비이다. 비문의 찬자는 당대 문장으로 평가받았던 최인연과 대사의 문하법손(門下法孫)인 석순백(釋純白)이다. 또한 문하승인 승려 단목(端目)이 명필 김생의 행서 글씨를 집자하여 승려 숭태, 수규, 청직, 혜초 등이 새겨 954년(광종 5)에 세운 비이다. 이 비는 신라말 고려초의 고승인 랑공대사 행적의 일생을 상세하게 기술하고 있고, 비석의 입비(입비)와 관련하여 비문의 찬(撰), 비문의 집자(集子), 비문을 건립하는데 관여한 인물 등 당시의 사회와 문화상을 고찰할 수 있는 구체적인 사실을 상세하게 기록하고 있어 역사적 자료로서 가치가 뛰어나다. 또한 김생의 글씨를 연구함에 있어 가장 기본적인 자료로서도 상당히 중요하다. This stone stele originally located in the precincts of Taejasa Temple in Bonghwa was erected in 954 to honor the life and achievements of an eminent Buddhist monk named Nanggong (832-916). 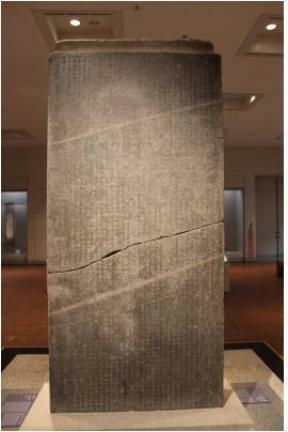 The inscription on the stele was composed by Choe In-yeong, a great man of letters of his time, together with the monk’s head pupil Seok Sun-baek. The inscription consists of characters collected by another of his pupils named Danmok from the writings of a great calligrapher named Kim Saeng, and was engraved by a group of four monk-engravers, Sungtae, Sugyu, Cheongjik and Hyecho. The inscription contains a rather detailed biography of the monk together with a record of the stele’s background, including the names of the people who participated in the compilation of the text, the collection of the calligraphic characters, and its construction. It is regarded as a valuable historical material that provides important clues about Korean society and culture between late Silla and early Goryeo. It also provides important basic materials with respect to Kim Saeng’s calligraphy.